Learn about the influenza (flu) virus, and its transmission, symptoms and prevention. This course will be of great interest to all learners who would like to learn more about the influenza (flu) virus, its transmission and prevention, as well as the "variants" responsible for swine flu. An influenza pandemic is defined as a new or novel influenza virus that spreads easily between humans. When new influenza viruses are introduced into the environment, humans don’t have any natural immunity to protect against them. Therefore, there is a risk that new influenza viruses could develop into a pandemic if the virus passes easily from person to person. The course begins by describing how pigs are susceptible to multiple viruses (avian, human and swine) and how this combination can result in an 'antigenic shift'. If a new virus type causes illness in people and is transmitted easily from person-to-person, an influenza pandemic can occur, such as the influenza A H1N1 pandemic in 2009, which effected 74 countries. 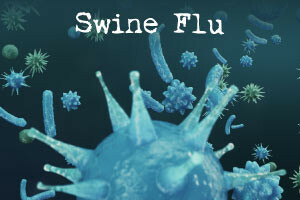 You will learn about the symptoms of swine flu, how to test for it, its diagnosis, comparison with the common cold, and travel and safety tips. Similar to seasonal flu, some people are at high risk of developing serious illness from variant flu virus infections. In severe cases, pneumonia may develop and death may occur. Most reported variant flu virus infections in people have occurred following exposure to infected pigs or their virus contaminated environments, particularly in association with large agricultural fairs. The course describes the risk factors that can lead to exposure to viruses, as well as precautions that can be taken to prevent the spread of flu between pigs and people. You will also learn about the importance of reporting and monitoring variant influenza, as well as the use of vaccines and anti-viral medicines. Define what Swine influenza (swine flu) and 'variant' influenza viruses are. Explain how variant influenza viruses can be transmitted. Describe what an influenza 'pandemic' is and how it can occur. Compare the symptoms of influenza with those of a common cold. Summarise the procedures and protocols for minimising the spread of Swine flu. Outline the role of vaccines and anti-viral medicines, in the treatment of influenza.